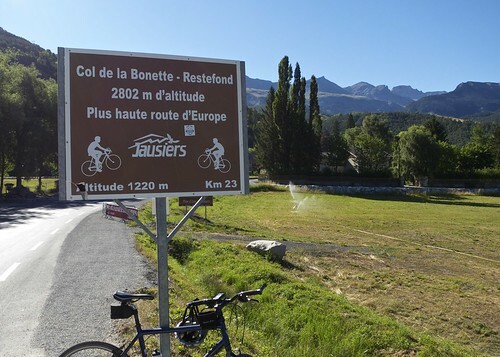 A sign at the very start of Col de la Bonette declares it the highest (paved) route in Europe – see small pic below. 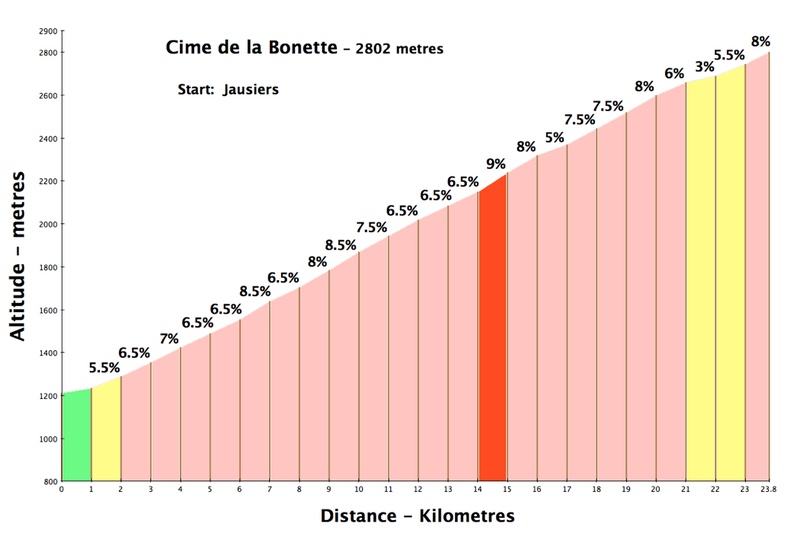 Pico de Veleta in Spain is in fact higher, but Bonette is still impressive (note: I’ve included the profile for both sides, although here I cycled up the north side and down the south). 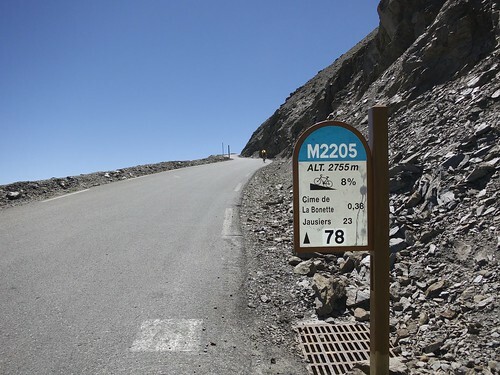 It’s not too steep, but almost always steadily up, and at 23.8 high-altitude kilometres, it’s a challenge. My plan was to use my tired legs to steadily climb the north side, descend the south side, and then find an interesting way to climb back. It’s a well paved, interesting climb, with lots of fun hairpins. More cyclists than cars, always a good sign. 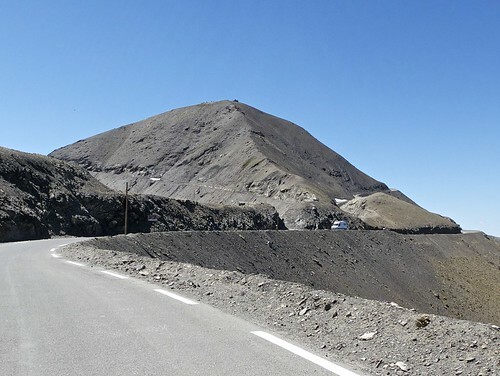 Approaching the top, the road passes the old military barracks at Col de Restefond (2656 metres) and then Col de la Bonette (2715 metres). At this point, one could turn left and descend the south side, but it’s obligatory to climb the extra loop added just to try and be the highest paved road in Europe. 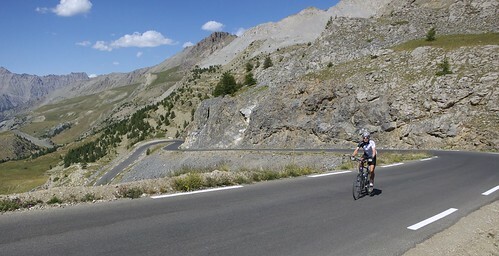 Photo: Col de la Bonette intersection in fore front, road up and around that black hulk to hit 2802 metres, Cime de la Bonette. “Cime” means peak or summit. Climbing the north side the last drinks stand is at about 2000 metres roughly half way up. Similarly the south side’s highest chance to refuel is also roughly half way up. Note, the route to Moutière is entirely paved – if bumpy. However, from Moutière back to the Bonette road is a bumpy, gravel road. Instead of reclimbing the south side, my plan was to take a lessor side road to Col de la Moutière. This quiet road enters a different valley, climbing through sparse woods before opening up above the tree line to great views — dominated by Cime de la Bonette far above. I had “mild” stomach troubles and tired legs but still thoroughly enjoyed this virtually deserted back route. 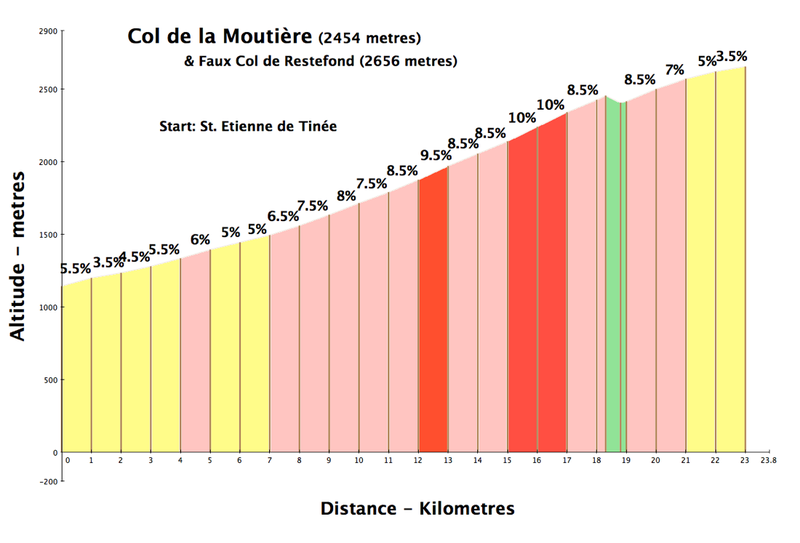 After Col de la Moutière there is a short descent then it is a bumpy, rocky 3km climb to Faux Col de Restefond and a link back to the Bonette route. It was worth the sacrifice to ride almost 80 kms on a hybrid instead of a road bike, just so I could manage the 3 bumpy kilometres and complete this really fun loop. Highly recommended. Bonette is super high and lots of fun. 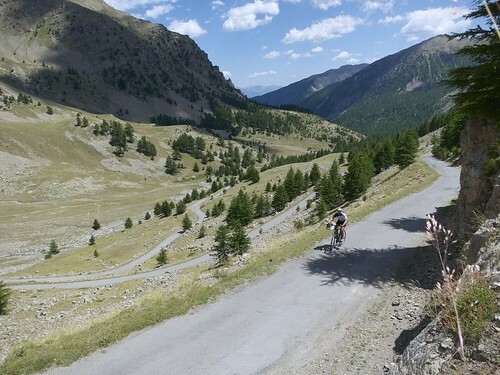 But it's the addition of the deserted, unpaved Col de la Moutière that turns this into a truly stellar loop. Hullo – my imagination or you are changing length for self timer? You seem super humanly fast! 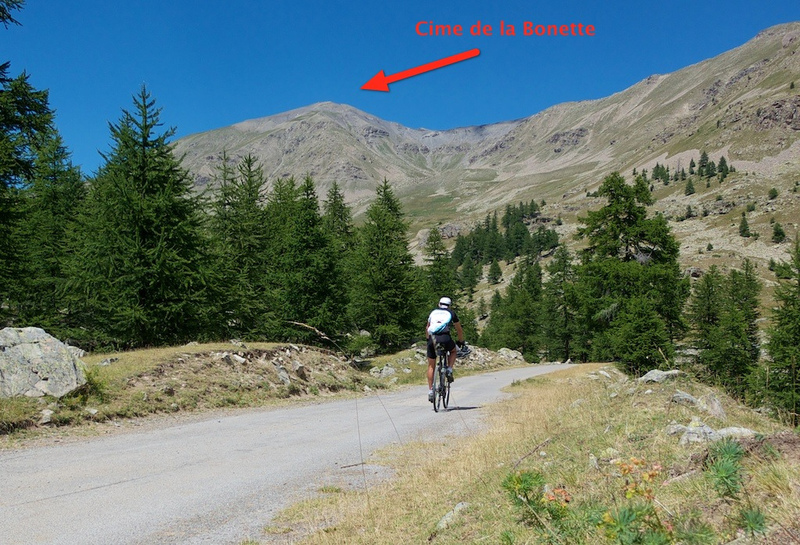 Hi Will, we climbed La Bonette about a month ago (I just put the post up) and it’s one of the most stunning climbs I have done so far! Well done! It’s not an easy climb. 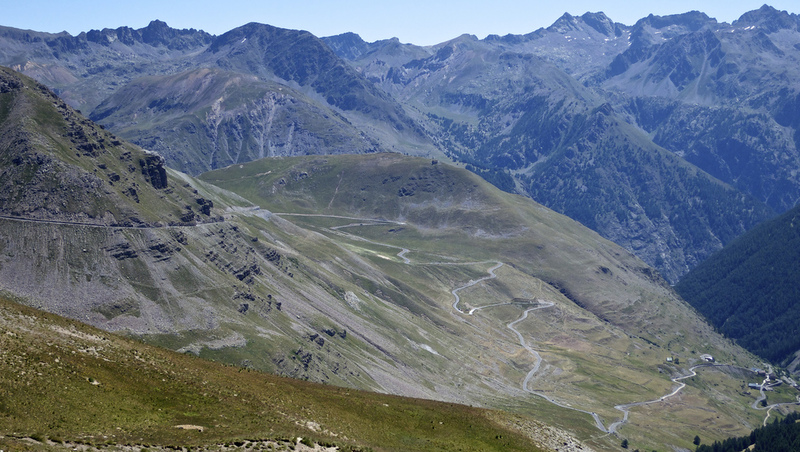 Great post on the d’Allos, Champs and Cayolle loop, too. 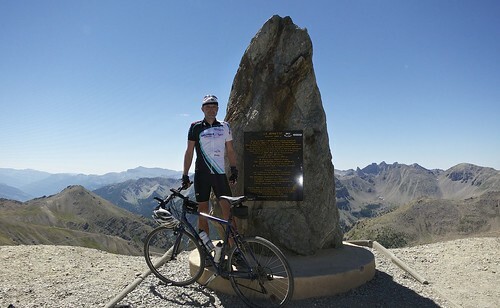 Great to read you are back to what you love most: climbing Cols! 🙂 And sorry we didn’t get in touch when we were in your area. We had friends over from Australia and with L’Etape it was all a bit rushed! Maybe we get another opportunity when we come through again after Spain. I’ll email you. It sounds like you are both doing some great climbs …. enjoy Spain. Yes, drop me a line if you get back into my neck of the woods. Just a quick question regarding your trip to the Bonette; did you guys manage to ride this loop and if so, was it rideable on a road bike. A friend and I are going to be hitting this up in August and I woudl like to have a crack at the back route up to the Faux Restefond. Hope you had some good rides over there. Look at Hodgey’s comment below. The route is fine on road bike until Col de la Moutière. then there are three very rocky kms to Faux Restefond. But it is uphill. So if you are not fussy it is difficult but possible on road bike. It is fairly rough in places as I remember. But only 3 kms or so. It really depends how fussy you are. If in no rush, you could always walk a touch – I know people have done it, and I know people that would think it stupid to do on a road bike. That stretch in the last photo doesn’t look too bad though 🙂 and it is a terrific loop.